Posted May 19, 2007 in 2007/05, 7 Freelance, DC Kirby, Periods, z Archive. Atlas may have started to use Kirby’s freelance work first but it was DC that published the majority of Jack’s art from this period. Part of the reason for this imbalance is due to Atlas undergoing the episode now call the Implosion. Although Atlas only stopped actual publication for a few months, a lot of what was used after the Implosion was left over inventory work. The Implosion may have biased Jack’s freelance work toward DC, I am sure the another reason was simply that DC paid better. 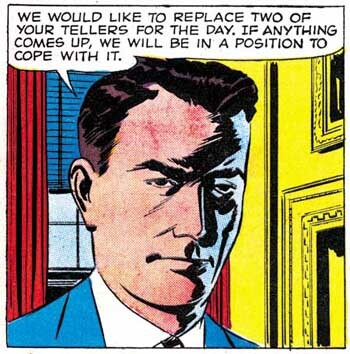 In any case there is a lot of work done between Jack starting at DC (February 1957) until when he left (June 1959). Potentially this chapter could have been the most significant one in this serial post about Kirby’s inking. Unfortunately I have very limited access to Jack’s DC work. Therefore I consider this chapter to be my most tentative. A more thorough analysis of Jack’s DC inking will have to wait but I fully intend to return to it someday. 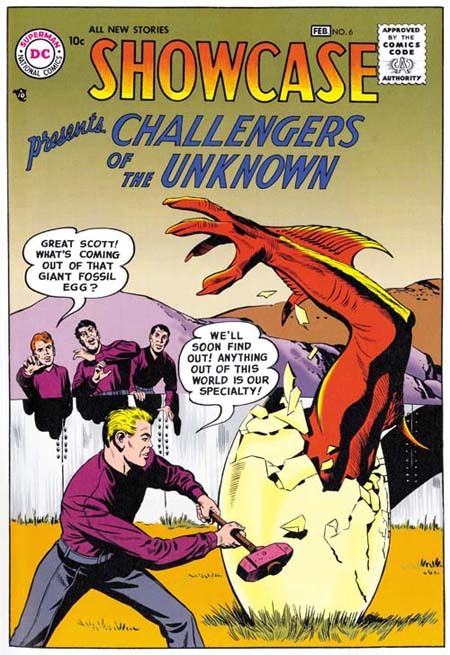 The Challengers of the Unknown was Jacks first freelance work to be published by DC. 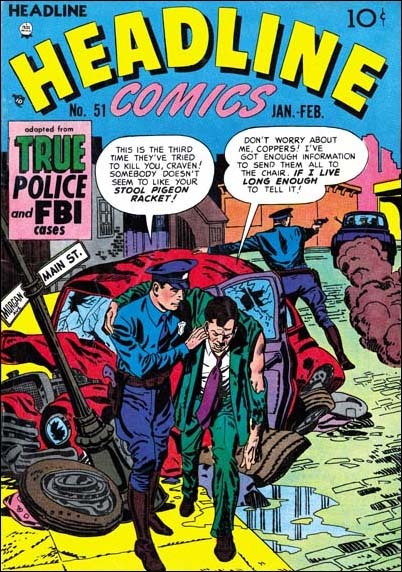 The Challengers were a Simon and Kirby creation but I have not detected any involvement of Joe in the production of the art. 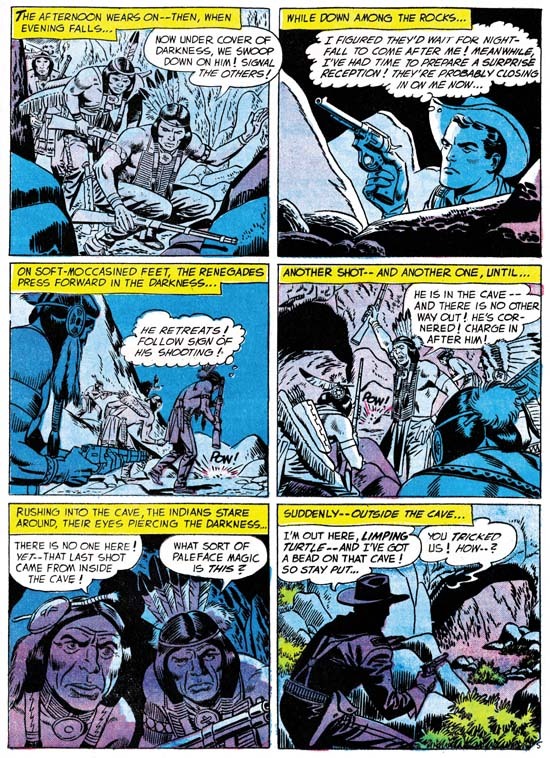 Jack did all of the inking of his pencils for the first two issues (Showcase #6 and #7). Considering the date, it is not surprising that we do not find any use of the Studio style. 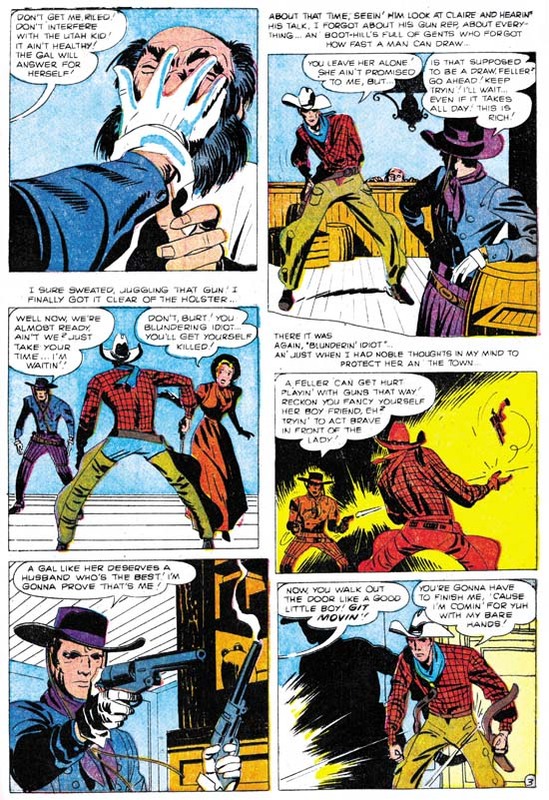 Besides Joe Simon has said that DC did not like the use of crosshatching, which they derogatorily referred to as hay. S&K Studio techniques such as the picket fence would have been seen by DC as particularly offensive. Perhaps DC’s attitude is why Jack abandoned the Fine Studio style that he used so successfully in the Yellow Claw. I may also explain the absence of pen work that Jack had been using for Atlas. So Jack used the Austere style when inking the Challengers. 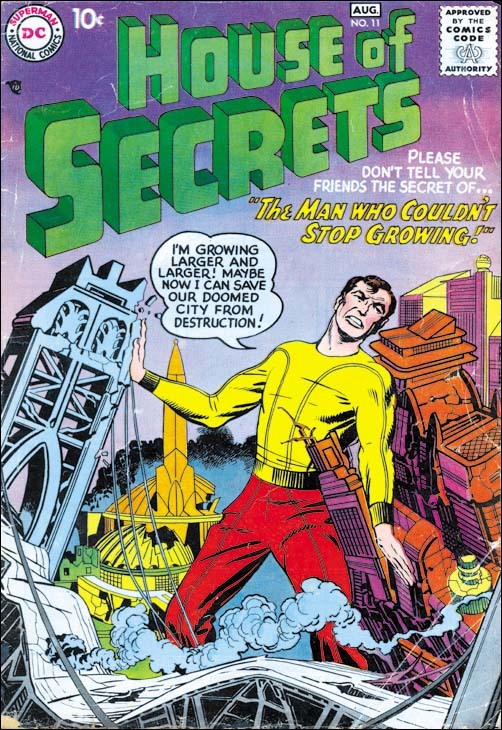 There are some holdovers from the earlier styles such as the abstract arch shadow that appears on the right side of the cover to issue #6. The first page of Showcase #6 probably gives an even better example of how Jack would ink the Challengers. No picket fences but there is the use of what could be called a modified drop string. Cloth folds are generally simple spatulate shapes. The image looks lighter with larger blacks done by flooding the area with ink. Also notice the shoulder blot in the circular panel. Kirby does nice inking for these stories but they seem to lack some of the spontaneity found in his Atlas and Prize work. It is possible that this is due to someone having “cleaned” up his inks. Since my observations are based on the DC Archive this might even have been done during restoration. After the first two issues other inkers began to be used. I used to think that Jack may have been involved in inking some of the later covers. But on reviewing them again for this post I no longer think that is true. 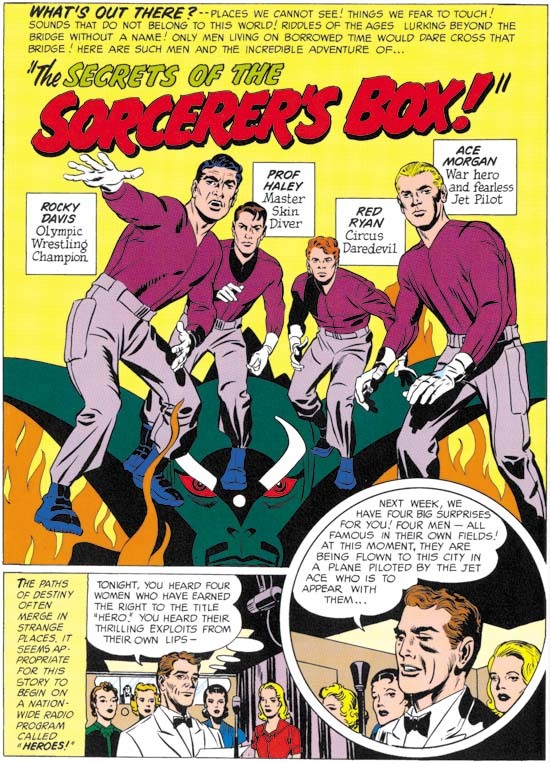 I am sure that for Kirby, and DC as well, the Challengers were probably Jack’s most important effort. It was not, however, the only material that he produced for DC. Jack also did a number of stories and some covers for DC’s horror comics. 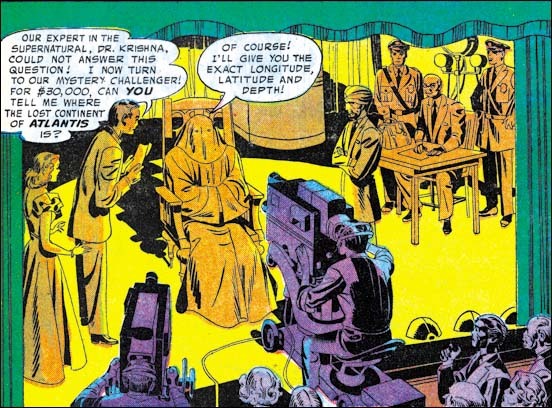 Perhaps because this work had a lower profile Kirby would do more of his own inking then he did for the Challengers. The inking style used was the same for both. 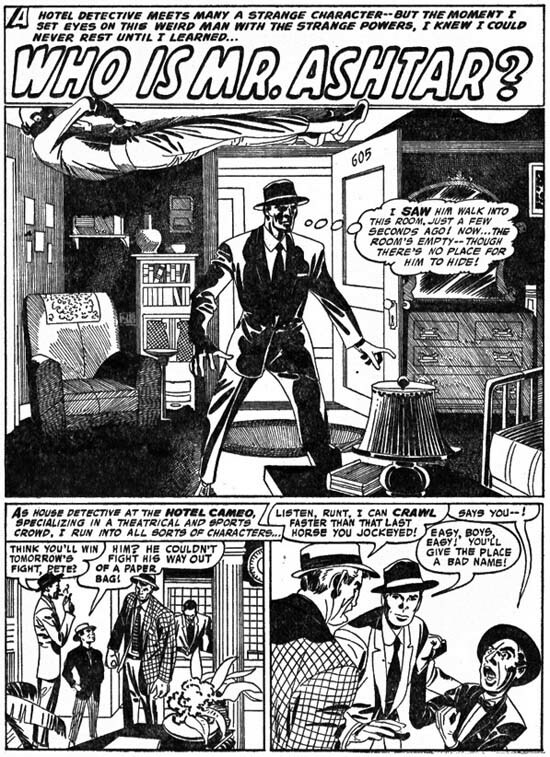 The example of the splash panel from House of Secrets #4 is typical Austere inking. I would like to draw attention to the casting of the chair’s shadow. 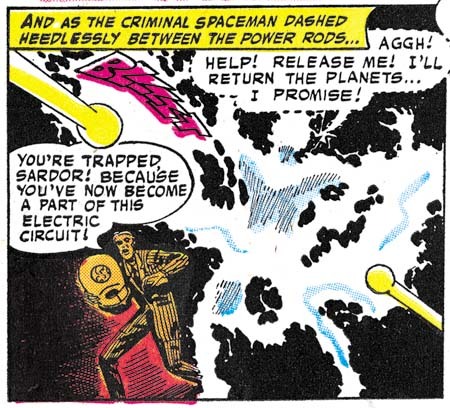 During the Simon and Kirby collaboration, shadows often were presented in a very abstract manner. So abstract that I am not always sure what things like the shoulder blots or abstract arch shadows are supposed to represent. The shadow for the chair provides some its source’s distinct features such as its oddly shaped legs. It seems to me that in Jack’s DC work there is more of an effort to provide more “realistic” shadows. 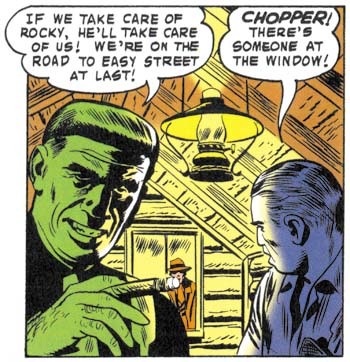 Although we do not find pen work in the Challengers art, it does show up sometimes in what Jack did for DC’s horror genre. Often pen use is limited to special purposes, such as the depiction of rain and stormy weather. 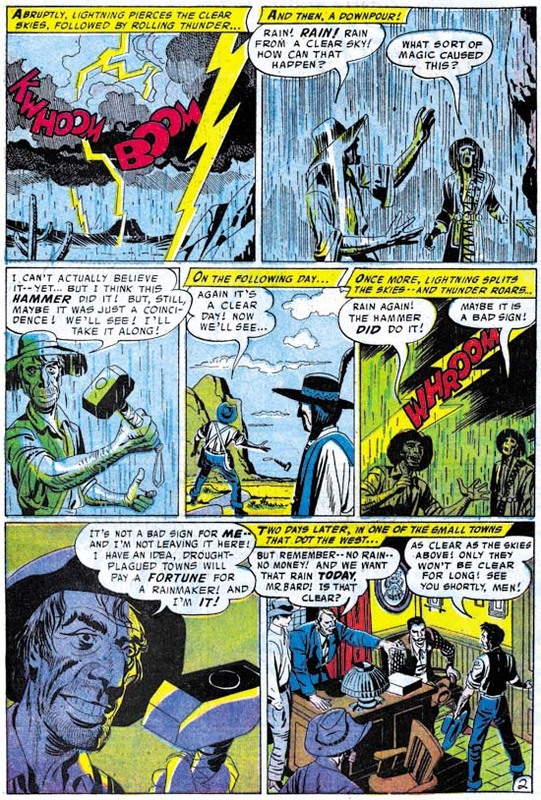 It is almost as if rain images provided Kirby with an excuse to use a pen, which he otherwise avoided when doing work for DC. The above splash is a case that received a lot of spotting using a pen. Is this an exception or was a pen used more frequently then I thought? Unfortunately my very limited examples of DC Kirby do not allow me to say. This example has more elaborate then pen use then what was done for Atlas. The frequent use of parallel pen lines, the spacing between lines, and some of the irregularities match what was done for Atlas. I suspect that the same hand did both. What I am less sure of is whether that hand was actually Kirby’s. The above example may look like complicated pen work but it is actually has a simple layout. Just the sort of thing that Jack could have directed an assistant to do. Provided that the assistant became comfortable with the use of a pen, they need not even had been an artist. Most of this splash page from Tales of the Unexpected #22 is typical Austere inking. But look at the spotting along the centers of the arms and legs of the right figure. Spot lines of this general type often are not used to indicate shadows but just used to provide an volume to the art. Therefore I refer to these as form lines. In this splash these form lines are unusual in how densely that are used. 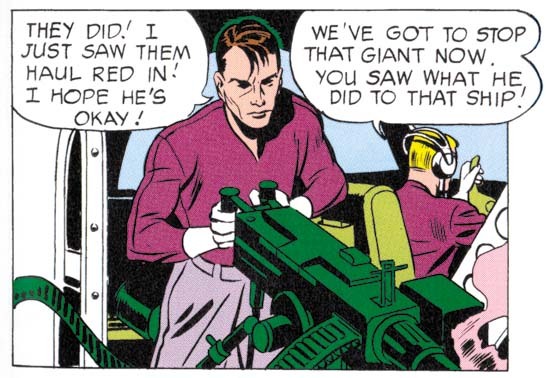 Kirby is using this special treatment because the men are wearing special uniforms, almost like spacesuits. This is probably done to suggest a metallic nature to the suit’s surface. Years later Jack would devise a totally different way of handling the same thing. 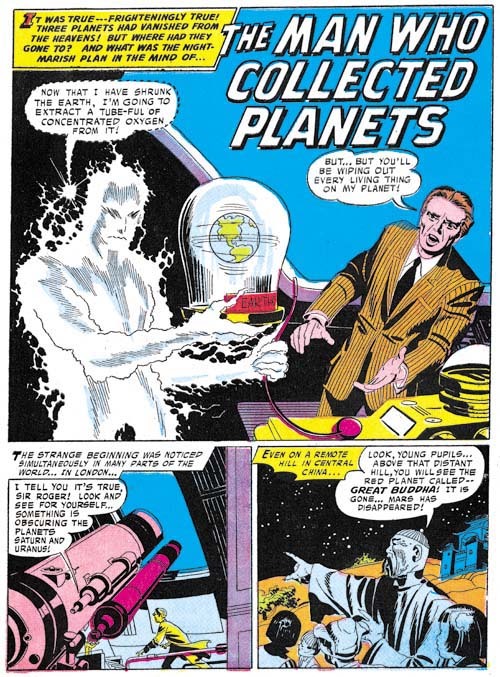 But this type of form lines was used frequently by Jack early in his career when he was doing science fiction stories (Early Jack Kirby Chapters 2, 3, 5, and 9. 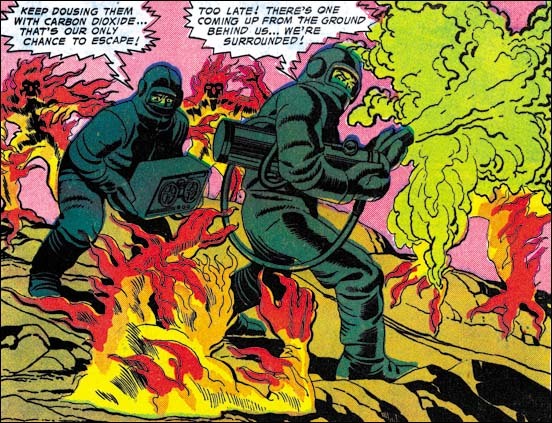 Kirby would also provide some covers for DC’s horror genre comics. These are inked in the Austere style very much the same brush techniques as the covers Jack did for the Challengers. Note the presence of drop strings which continue to be used but in a more reserved manner. There is some spotting using a pen but it is very unobtrusive. In this case the pen is limited to the dust cloud in the background. 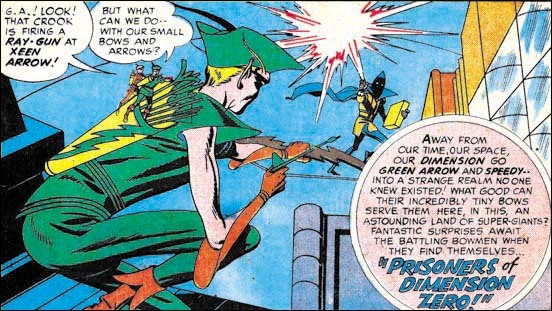 DC had a wide array of superheroes but Kirby would only get to work on one of them, the Green Arrow. 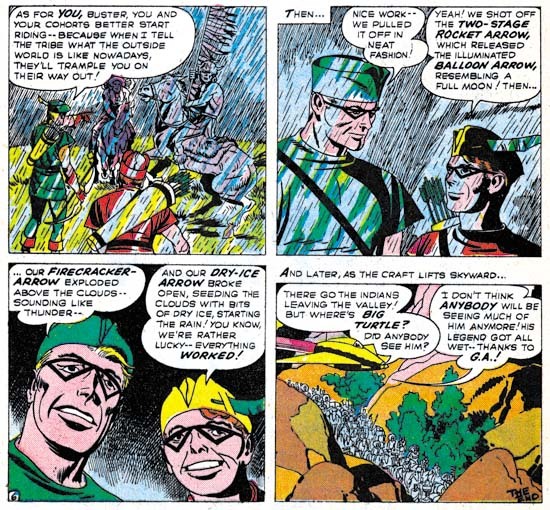 The Green Arrow appeared in Adventures Comics where it was effectively a backup feature to Superboy. I do not know if I can say that the Green Arrow was DC least significant superhero, but it certainly was among the less popular ones. Was this reluctance to use Jack for standard superheroes because most of his recent work was outside the superhero genre or was it because they feared that Jack’s unique style might conflict with the previous image of these superheroes? In a way DC’s management was probably correct because the Green Arrow immediately showed the Kirby touch. Not just in the art either, the stories showed Jack’s influence as well. 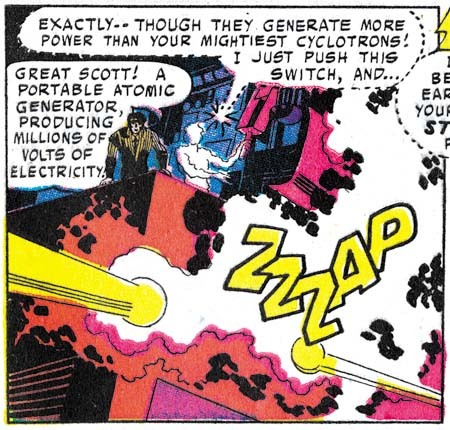 This may explain why Kirby only lasted seven issues. Jack had done something that was considered almost criminal by some at DC, he made the Green Arrow interesting. Jack did his own inking for all of his Green Arrow pencils. The inking was the same Austere brushwork that we have seen used else where at DC. Perhaps because the stories were on a regular schedule the inking seems a little bit more rushed then some of Kirby’s other DC work. 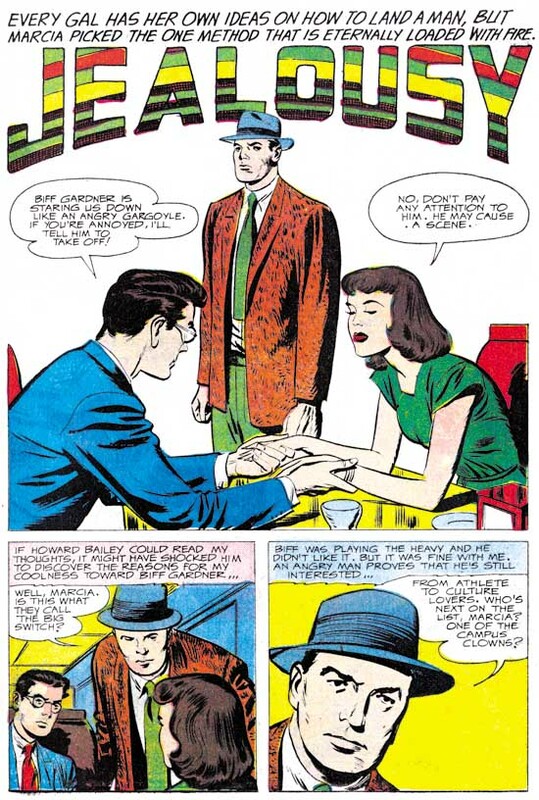 In the introduction to the tradeback reprint, Mark Evanier says that Jack’s wife Roz helped with the inking. This was probably limited to filling in blacks or maybe even doing some outline inking with a pen. Spotting with a pen also limited in the Green Arrow art. But it does show up and once again is used for rain scenes. 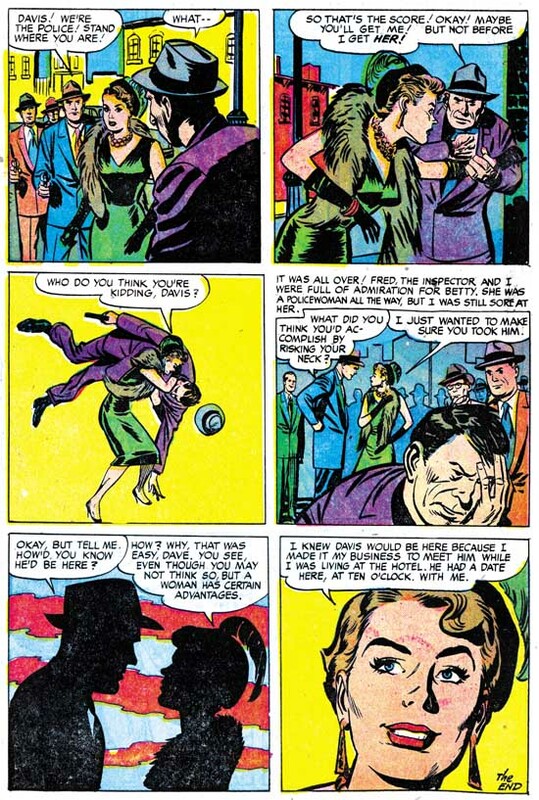 Could Roz have done some of this pen work under Jack’s direction? It is hard to tell from these stories but this is a topic that I will return to in this series.